One of the best things about Barbados is the amazing selection of restaurants it has to offer. It is widely acclaimed as the restaurant capital of the Caribbean and for good reason. There are more ocean side Barbados restaurants than any other Caribbean island. But there is also a great selection of beach bars, bistros, rum shacks and authentic roti houses. Some of the most popular food in Barbados are Mahi Mahi or Dorado which is also referred to as Dolphin. But don’t confuse it with Flipper. It is a completely different fish. It is a white flaky fish and really delicious. Other recommended catches are Barracuda, Red Snapper, Flying Fish, Tuna and locally caught shrimp and lobster. During the high season, many of the fine dining restaurants are heavily booked so it is very wise to make advance reservations. Our complimentary pre arrival concierge department will be happy to help you with all your dining requirements. We have also sampled many of the local restaurants and are happy to give you a review of some of our firm favourites. The Cliff is truly magical. The view as you enter will literally take your breath away. It is rated one of the top restaurants in Barbados for good reason. Both the food and the atmosphere are hard to beat. It is most definitely not the cheapest restaurant in Barbados but it is the perfect location for an anniversary, birthday, wedding celebration or any special event as it is just so truly special. One of the things we like most about the location is the way they have lit up the sea just below the restaurant. The light attracts massive sting rays and tarpon close to shore and they are absolutely fascinating to watch. 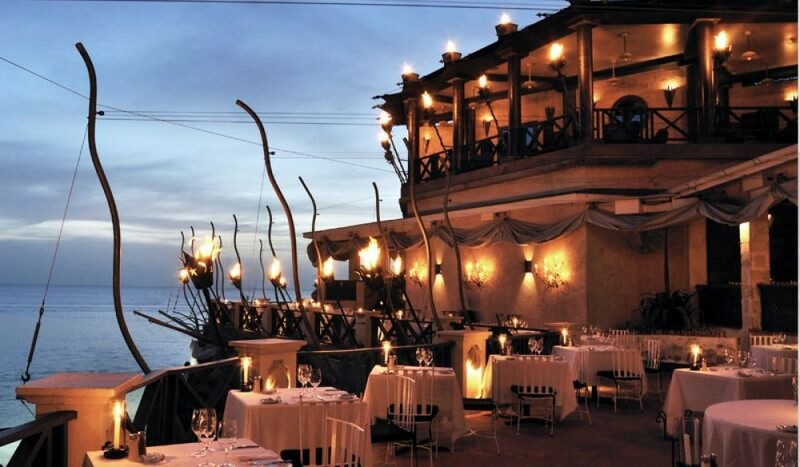 The restaurant is also completely torch lit which lends it a very romantic atmosphere. The food is equally memorable. We had Carpaccio of Beef, Char grilled Barracuda and a desert called The Flaming Snowball – ice cream and strawberries in a meringue ball and flamed with Grand Mariner! Absolutely amazing! The cliff restaurant has just recently opened the Cliff Beach Club. It is more casual and more relaxed then The Cliff main restaurant. It is located right next door and built very cleverly over four levels. Each level faces the sea. The food is excellent but it is also a very cool and trendy place just to pop in for a drink before or after dinner. They also have live music on many nights especially at the weekends. The Cliff Beach Club is also open for lunch and it is perfectly fine to go casually dressed in a tee shirt and shorts. Tides is another one of our personal favourites. It is located right in the centre of Holetown directly on the beach. It was completely modernised this year and the results are fabulous. The interiors are now much more contemporary then they were and the bar is super cool for a pre dinner drink. They have also opened an air-conditioned fully glassed area in case you prefer not to sit in the tropical heat but still enjoy the fabulous views. The food is always excellent. We had the Sautéed Spiced Jumbo Shrimp and Thai Crab Cakes followed by the Blackened Tuna and a Trio of Crème Brulee. Tides also houses one of the best art galleries on the island. As you enter the restaurant there is a courtyard and the art is on display both here and in the bar. They feature a lot of the best local and Caribbean artists as well as some beautiful semi precious jewellery. Lone Star has been open now for 14 years and it is always spectacular. It was updated two years ago and has a fabulous beach front setting. It is wonderfully elegant and at the same time very relaxed. It is open for breakfast, lunch and dinner and also has a lovely bar which is ideal for either a pre or post dinner drink. Some of our favourite items on the menu are the Lobster and prawn salad, the Balti Chicken Tikka Masala and the Lone Star Dame Blanche. Fish Pot – West coast above Speightown. The fish pot is located further north on the west coast just past Speightstown on the coast. It has a fabulous setting overlooking Six Men’s beach and bay. It is more relaxed and down to earth then some of its counterparts and the food is always great. We love it for both lunch and dinner and the atmosphere at both times is quite different. They serve a lot of locally caught fish infused with local herbs, spices and fruit which create really exciting flavours. We particularly loved the Seared Scallops and the A Hai Tuna. If you are staying at one of our most popular resorts Saint Peters Bay or Port Ferdinand it is possible to take a water taxi to the restaurant which is fun. Mullins Beach Bar and Restaurant is quite legendary on the west coast of Barbados. It is located on one of the most popular and best beaches on the island. The beach here is a perfect palm fringed crescent shaped stretch of pristine white sands and calm turquoise waters. The restaurant and bar is casual and down to earth where shoes are optional yet it is still quite elegant and the food is delicious. The panko crusted shrimp are always great as well as the ribs. The cocktails are also excellent. If you like live music and a party atmosphere then Sunday is a great time to go as it the sun starts to set, the dancing starts. Located north of Mullins Bay in the parish of St Peter, Bombas is a great casual and down to earth option for either lunch or dinner. The food is always fresh and the local fishermen deliver their catch each day. It is colourful with electric music and good service. There is a small boutique here which features colourful sarongs and jewellery from Tanzania. Jumas has a great location right in the centre of Speighstown whilst also being directly on the beach and ocean. It is run by the owner Mark and his wife Jules and serves a combination of Thai, Bajan and French dishes. It is open for breakfast lunch and dinner. This is another firm favourite of ours. It is the more casual restaurant at Sandy lane. It has a fabulous location right on the beach. 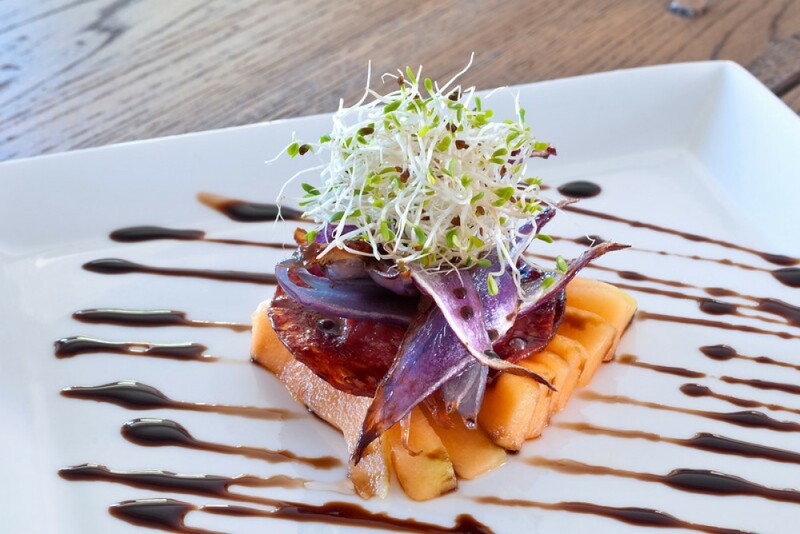 It is open for breakfast, lunch and dinner each day but our two favourite times to go are either for the Sunday Brunch or on the Caribbean night which takes place each Tuesday. Both occasions offer a spectacular buffet with the most impressive choice of food. After dinner on Tuesday, there is a great Bajan floor show followed by live music and dancing. L’Acajou is a lovely restaurant if you are looking for fine dining and want something very special. The atmosphere is very magical and very romantic. The restaurant is on the first floor with views of the ocean. They also have an amazing wine list which even the most knowledgeable wine buff will be impressed with. 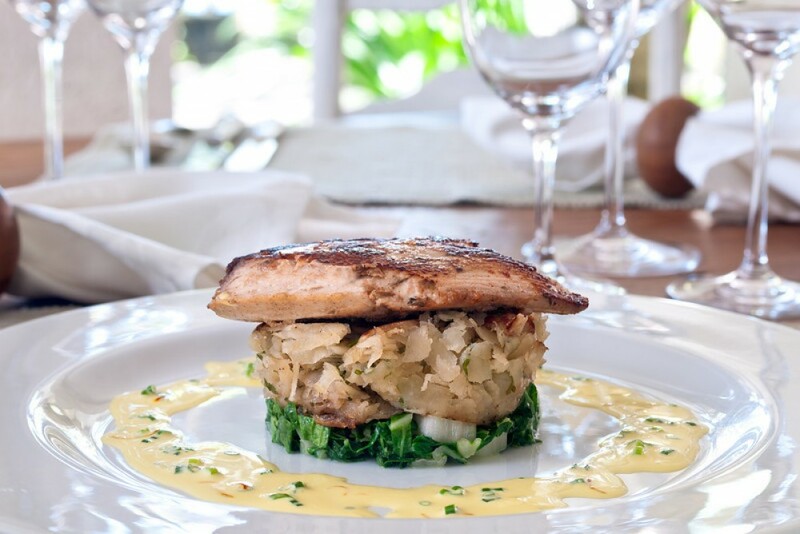 Daphne’s Restaurant, a sister of the famous London restaurant is one of the top restaurants in Barbados. It is located on Paynes Bay and if you are staying in one of our villas or properties in Old Trees, Smugglers Cove or Coral Cove, you will be able to walk along the beach to the restaurant. It is an elegant beachside restaurant which offers both alfresco and covered dining with a lovely atmosphere. The menu is primarily Italian but with a Caribbean twist. We had Italian Antipasto followed by Red Snapper cooked in a salt crust. 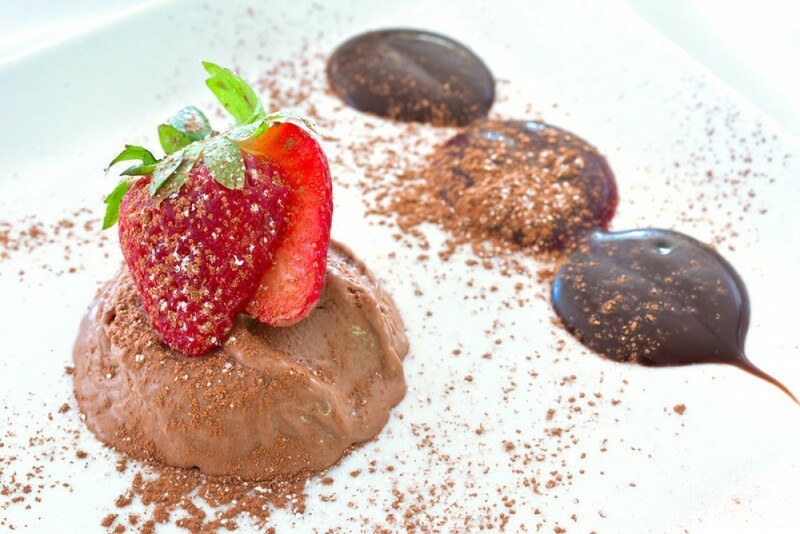 Nishi is a relatively new addition to the gastronomic offerings in Barbados. The menu is very different to anything else in Barbados. It has a mixture of Asian and Caribbean cuisine served in an informal yet sophisticated atmosphere. There is also a great Sushi bar upstairs. The lovely thing about Nishi is that you will have a choice of eating indoors or outside under the stars....something which is rare to find in most Asian restaurants around the world. It is open 7 days a week for dinner. The restaurant whose name is pronounced Chin Chin is one of the newest additions to the Barbados restaurant scene. It is very chic and contemporary compared to some of its counterparts yet still has a wonderful location right on the sea. When you visit Cin Cin you can choose to either sit indoors in the air conditioned glass fronted area or outside on the terrace and listen to the sounds of the ocean. There is also a very trendy bar at Cin Cin and they have some fabulous cocktails which are a pre dinner must. The food itself is a mix of Mediterranean style dishes with a Caribbean twist. It is open every night for dinner and on Monday to Friday for lunch. Located at Carlisle Bay, just south of Bridgetown, Lobster Alive is quite a legendary spot in Barbados. It is very casual and laid back. I you wish to, you can pick your own lobster which you can then request to be cooked in a variety of different way. We chose the Lobster Thermidor which was delicious. Lobster Alive is open every day for lunch and dinner except on a Sunday when they have lunch only. If you like jazz, this is the time to go as they have live music. Relish is both a deli and a café offering a variety of fresh food and wines. There are lots of healthy options and you can choose to either eat in or take away. The Lime Bar is one of the trendiest and coolest places to hang out in Barbados right now. It is located in the Lime Grove Lifestyle Centre and is cool and edgy. They have regular live entertainment. For food, you can choose to have tapas style food or full menu. It is open every day from 10am to late! The Drift is located right in the middle between Tides Restaurant and The Beach House Restaurant. It is one of the newest and chicest places on the West Coast. They have a great cocktail menu and also a good selection of fine wines. The drift also has an art gallery selling both local and international art. For food, the Drift serves small bites and on the first Thursday of each month they do the Drift Bento Box Extravaganza. We highly recommend a visit for either pre or post dinner drinks. Just Grillin’ is one of our favourite places for quick casual and healthy food. The menu normally features at least 5 different types of freshly caught and cooked fish. Other offerings include shrimp, steak, ribs, chicken and burgers. You can get a selection of different side orders such as salad, grilled vegetables and potatoes as well as Bajan Rotis and wraps. The Beach House is located right in the centre of Holetown and also directly on the beach. The menu is a blend of Caribbean and Mediterranean influences. On Sundays for lunch you will also find a Caribbean buffet with live music which is very popular. Il Tempio is the only totally authentic Italian restaurant in Barbados and was a firm favourite of Luciano Pavarotti when he used to visit the island. It has a wonderful location right on the beach in Fitts Village south of Holetown. The Atlantis is one of the most legendary spots in Barbados. It has the same owners as the Fish pot and Little Good Harbour. It has the most breathtaking location in Bathsheba overlooking Tent Bay. It is worth visiting just for the scenery but the food is also excellent. They offer a buffet on Sunday and Wednesday and the rest of the week there is a really good authentic Bajan menu. 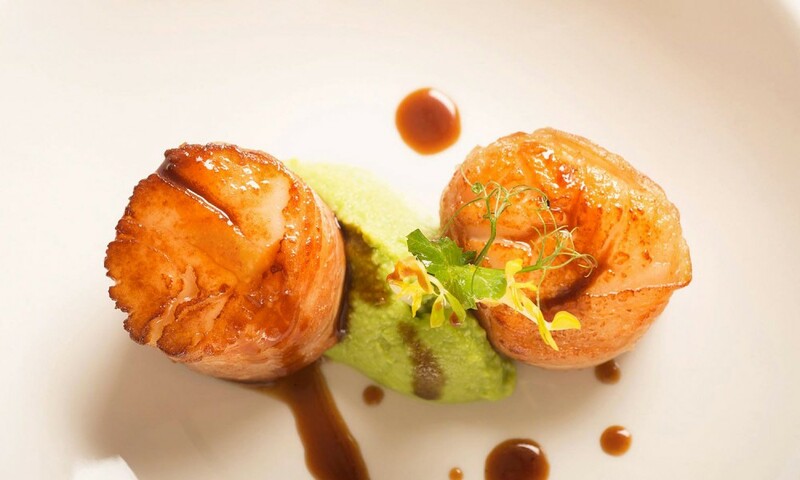 L’Azure was once described by Zagat as “Heaven on Earth”. And for good reason, the view from the terrace to Crane Beach is totally breathtaking. The beach itself was also voted amongst the top 10 in the world by the Lifestyles of the Rich and Famous. For this reason alone, we think it is a must visit for lunch whilst you are on the island of Barbados. They also do a great Sunday Brunch at L’Azure called the Sunday Gospel breakfast. Here you will find live performances and steel pan as well as a great buffet with a huge selection of food. To book one of these Barbados Restaurants, please contact our concierge Julie for more information.